The Imaging Center at UT Health San Antonio provides a wide range of services for diagnostic imaging and other radiology services. We have the latest technology and equipment in the industry including a 64-slice CT scanner, 1.5 & 3T MRI, ultrasound, digital X-ray and bone densitometry. Our professional and friendly staff always work to make your exams easy and efficient so we can get your doctors the information they need to continue your medical treatment. 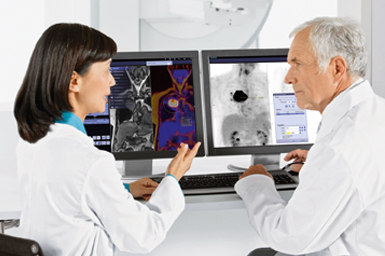 Our board-certified radiologists are experts in all fields of medicine and imaging. They work with your doctors to bring you the best medical care possible. Please take a moment to review some of the information regarding the services we offer and our suggestions that could make your exam more complete and comfortable. Release of Information: If you are taking your images from UT Health San Antonio to another facility, you will be required to contact the Release of Information Department at 210-450-9760. Please call our Imaging Center at 210-450-6000 for scheduling and appointment instructions.